CEP offers data-driven, customized advising to funders — including individual funders and donors, groups and collaboratives, and philanthropy-serving organizations — to help them better understand and improve their effectiveness. Advisory engagements leverage CEP’s deep knowledge about philanthropy and what matters to foundation stakeholders. We help funders answer important questions regarding their work, identify and address existing challenges, learn and share with their peers, and hear from their valued constituents. Drawing from more than a decade of experience designing surveys, conducting interviews, building comparative data sets, analyzing data, and facilitating discussions, CEP conducts its work with a high level of rigor and a focus on providing actionable insights. If you’re interested in exploring a customized advisory project, please be in touch with Mena Boyadzhiev to learn more about how we can support your work. CEP has been a critically important resource to the Hilton Foundation as we set out, a decade ago, to become a more strategically effective foundation. Recently our foundation has been undertaking a review to prepare for future growth. In 2017, we asked CEP to be a partner to help us reflect on our current position in the philanthropic ecosystem and how our approach can help us maximize our future impact, while living our founder’s values. CEP has played an instrumental role in helping us address these questions. Their great listening and thoughtful questions, unique knowledge of philanthropy, and excellent analysis brought new insight and helped us chart a path forward. CEP surveys diverse groups of foundation stakeholders on their perceptions of a funder’s impact, communications, grantmaking practice, and more. CEP provides groups of peer funders support in collecting and sharing internal operational and structural data. CEP works with boards and staff as they develop plans to implement effective practices. CEP structures efforts to develop and use organizational performance indicators to help funders track progress, learn from experience, and modify plans as appropriate. CEP designs and delivers workshops and group learning opportunities for boards and staff at one foundation or with groups of foundations. CEP’s interactive Working Well with Grantees workshop helps foundation staff understand and act on the research-based practices that define and support strong relationships between funders and grantees. Including profiles of exemplars, this workshop is appropriate for affinity groups, regional associations, or individual funders. Using CEP’s definition of foundation effectiveness as a framework, CEP collects and analyzes the information and examples a funder needs to determine its capacity, effectiveness, and opportunities for improvement. Our progress over time has been validated by positive feedback from CEP grantee perception surveys, our monitoring evaluation and learning partners, and other third party analysis. On this exciting and rewarding journey, the CEP team continues to be responsive, flexible, and thoughtful in working with staff, senior management and our board. We greatly value our ongoing partnership. Philanthropy New York’s success is directly linked to our ability to build networks and learning opportunities that meet the needs of our membership. When we contacted CEP to help us survey our members, they jumped at the chance to apply their expertise to our membership. The Advisory team worked hand in hand with our staff, helping us to tease out exactly which questions we needed answered. They took the time to get to know Philanthropy New York, understand our services, and develop a tool that helped us hone in on our goals. The process was, for us, as important as the outcome. And, the report is one we use regularly when we think about how to direct resources and develop new programming. The Kresge Foundation commissioned the Center for Effective Philanthropy to design and administer a custom Grantee Perception Report pulse survey to measure organizational progress against key areas for improvement born out of the 2014 GPR. 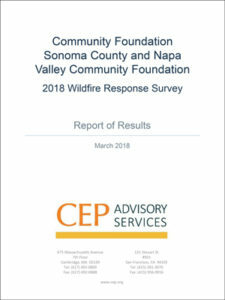 Specifically, we assembled a foundation-wide task force to analyze grantee feedback about our application and reporting system, communications and staff responsiveness and develop a comprehensive plan of action to ensure continuous improvement. The pulse survey has helped our staff gather more immediate feedback and make small but swift adjustments to continuously improve our grantee relationships.